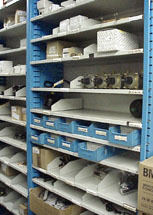 Rugged and flexible bins organize your small parts inventory. Designed for dealership Parts Departments, slide-in shelves and sliding dividers adjust easily to match changing inventories. Flexible bins allow parts to remain in proper sequence for quick identification and retrieval. Inventory control is increased and parts personnel are more efficient.